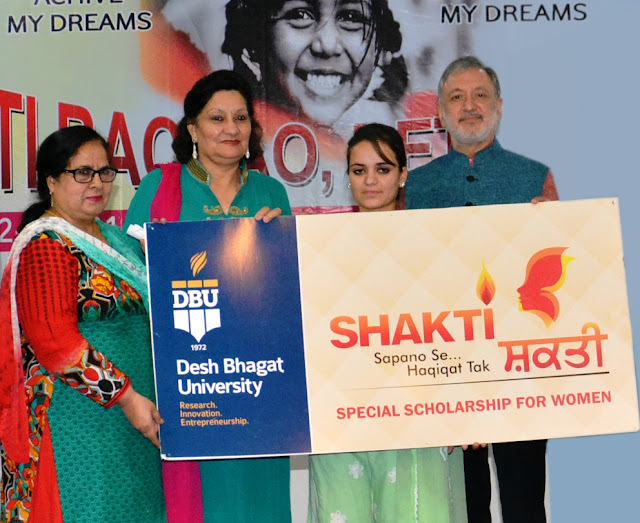 To promote higher education among girls and make it sure, Desh Bhagat University has launched its Special Scholarship Scheme ‘Shakti’ for all girl students. In a very impressive function, Mrs. Umesh Shaqir, State President ‘Beti Bachao Beti Padhao’ launched the scheme for new session. It’s worth mentioning that under Shakti Scheme, now girl students will get the benefit of 50% concession in total tuition fee in their first academic year. Mrs. Shaqir highly appreciated the initiative taken by the university. She exhorted the girls to take full benefit from this scheme and fulfill their dreams by getting higher education which is time and market relevant. Speaking on the occasion university Pro-Chancellor Ms. Tajinder Kaur expressed the view that the role of education is very important to uplift the status of females in the society and the university is pledged to bring about a social revolution by providing educational facilities to all the sections of the society, especially to girls. Chancellor Dr. Zora Singh asserted that education is our fundamental right and the objective of the university is to spread the light of education in every corner. To ensure that even the weakest of the weak are able to get higher education, the university has instituted a number of scholarships and concessions for the needy students. He asserted that Shakti Scheme will prove a blessing for the girl students. Vice President, Desh Bhagat United Er. Sandeep Singh said that Desh Bhagat University endevours to bring social equality through education and it is moving ahead in this direction with sincerity. On this occasion, personalities from different fields were present.